(Eritrea) 1951 telegramme stamped on reverse with 10c. on 1d., 1s. on 1/- pair and 10 shillings on 10/- tied Asmara Central cds, stamps with perfin. (Eritrea) 1951 telegramme stamped on reverse with 75c on 9d., 5sh. on 5/- and 10sh on 10/- tied Asmara Central cds, stamps with perfin. (Eritrea) 1951 telegramme stamped on reverse with 50c on 6d., 2sh.50c on 2/6d. and 5sh. 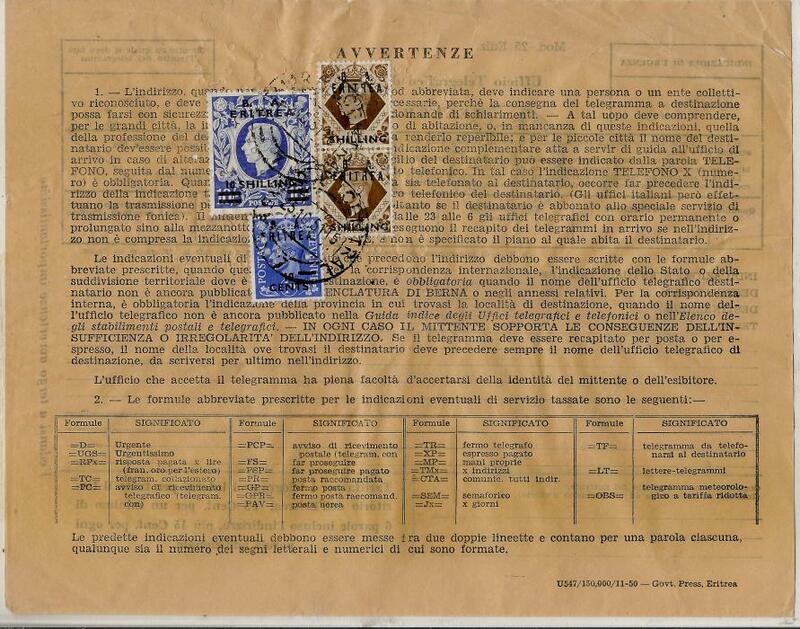 on 5/- tied Asmara Central cds; stamps with perfins. (Eritrea) 1951 telegramme stamped unusually on front bearing single franking 5 Shillings on 5/- tied Asmara Central cds, stamp with perfin. 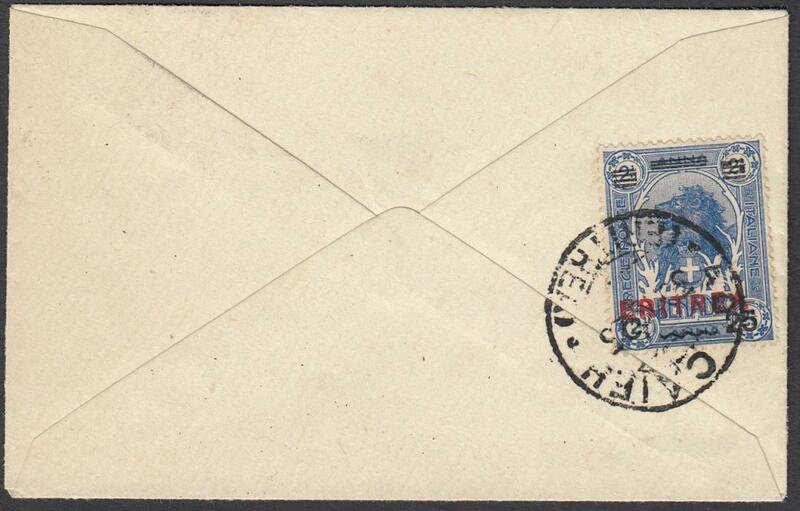 (Eritrea) 1951 telegramme stamped unusually on front franked 25c on 2 �d., 1sh. on 1/- (3) and 5 Shillings on 5/- tied Asmara Central cds, stamp with perfin. 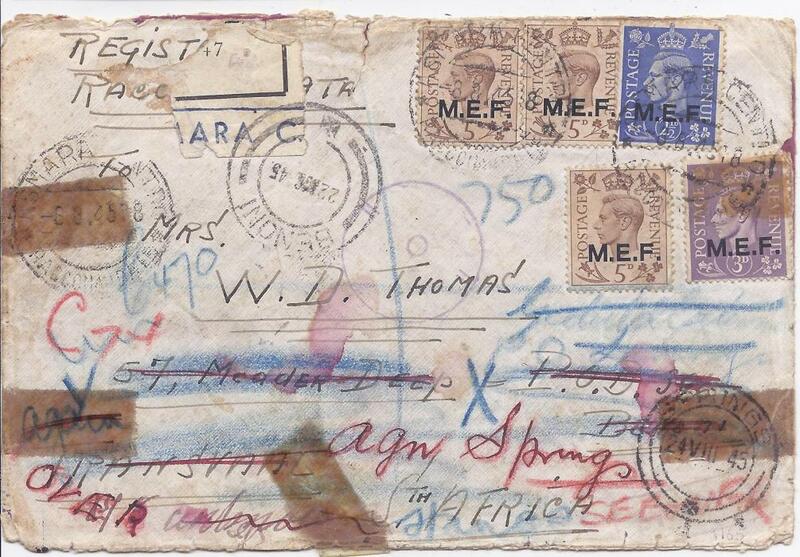 1916 registered cover to ROME franked with 4 x 20c. on 15c. + 5c. 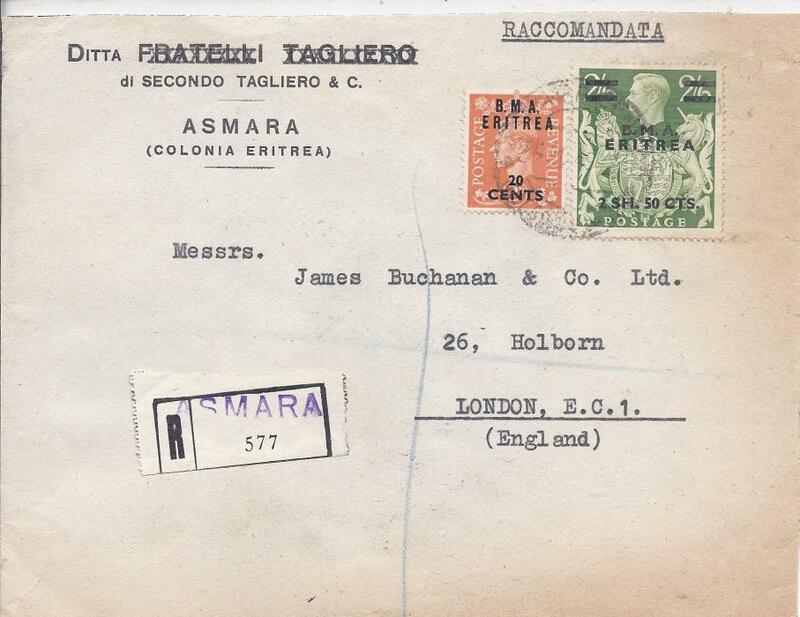 cancelled 'ASMARA-RACCOMANDATE/(ERITREA)'cds; arrival backstamp; fine and attractive. 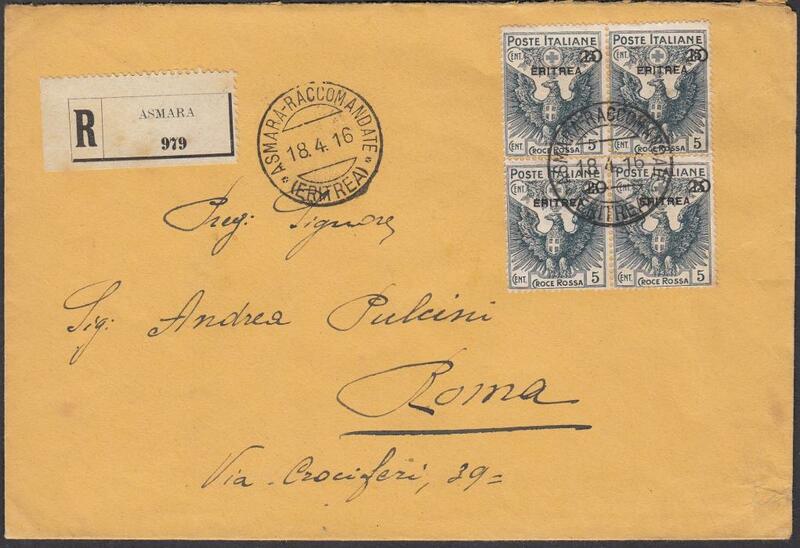 1926 (30.12) small calling card envelope to ASMARA franked on reverse 25c. on 2�a. 'Lion' tied 'ADI CAIFU/(ERITREA)' cds, repeated on front. Fine local unsealed cover. 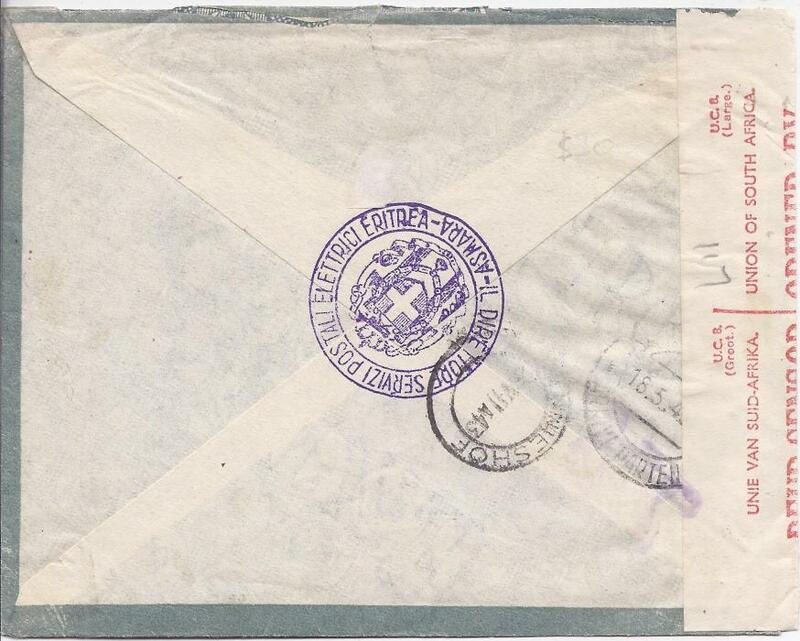 1946 registered airmail sample envelope containing a sample of Sisal Rope to Tel Aviv, Palestine,franked overprinted 2d., 2 1/2d. and two 2/6d. 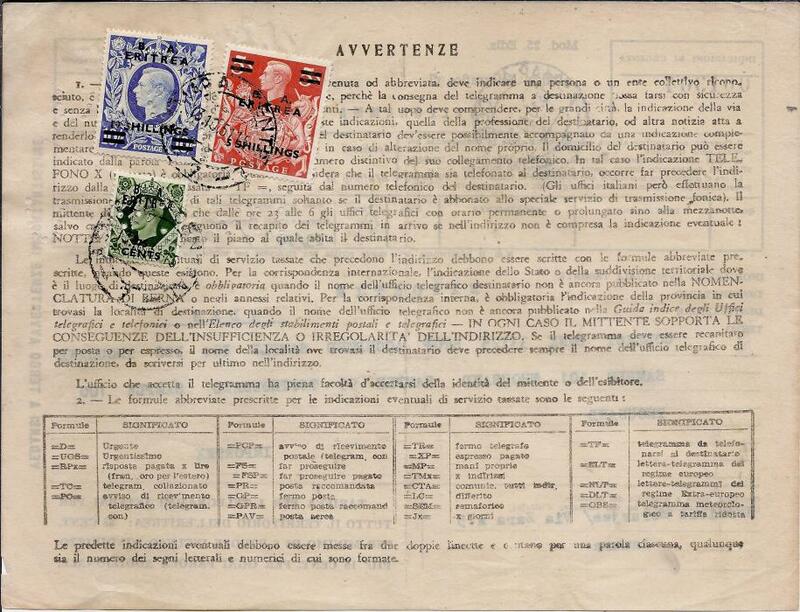 tied Asmara Centro date stamps, further despatch cancels on reverse together with Jerusalem transit and arrivals; fine and rare high value commercial item. 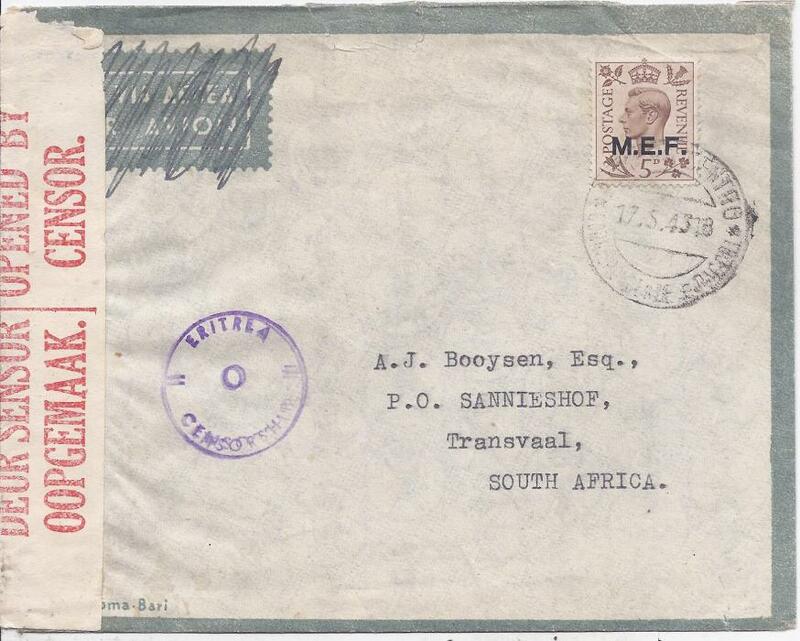 Eritrea 1943 cover to South Africa bearing single franking M.E.F. 5d. 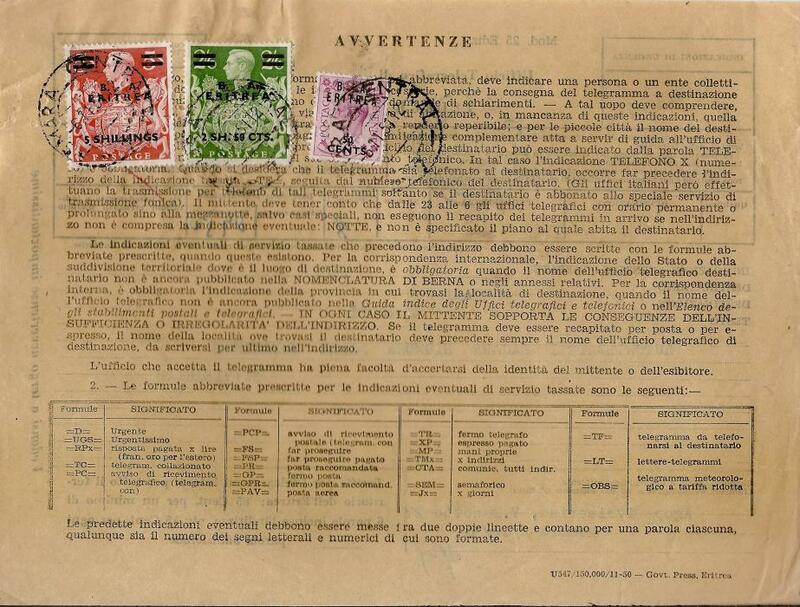 tied Asmara Centro cds, fine Eritrea/o/Censorship handstamp to left with South African censor tape down left side, reverse with cachet Il Direttore Servizi Postali Elettrici Eritrea - Asmara overstruck by arrival cds. Eritrea: 1945 (12.6.) 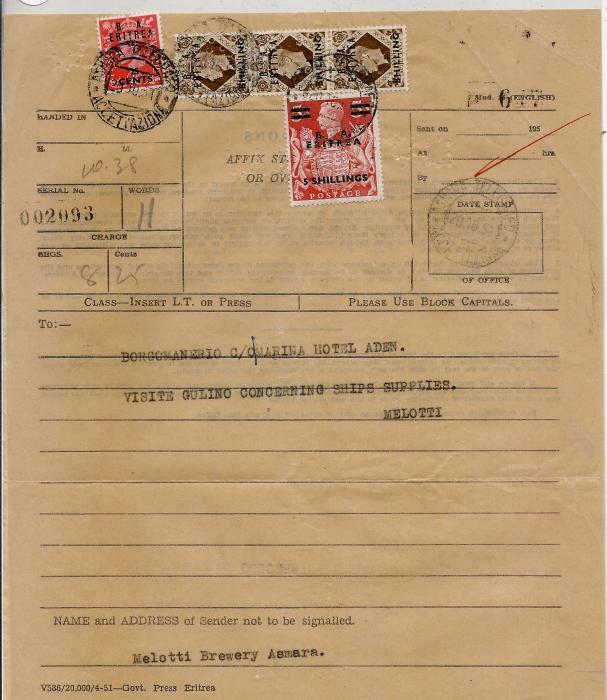 censored cover to Aden, franked 'M.E.F.' 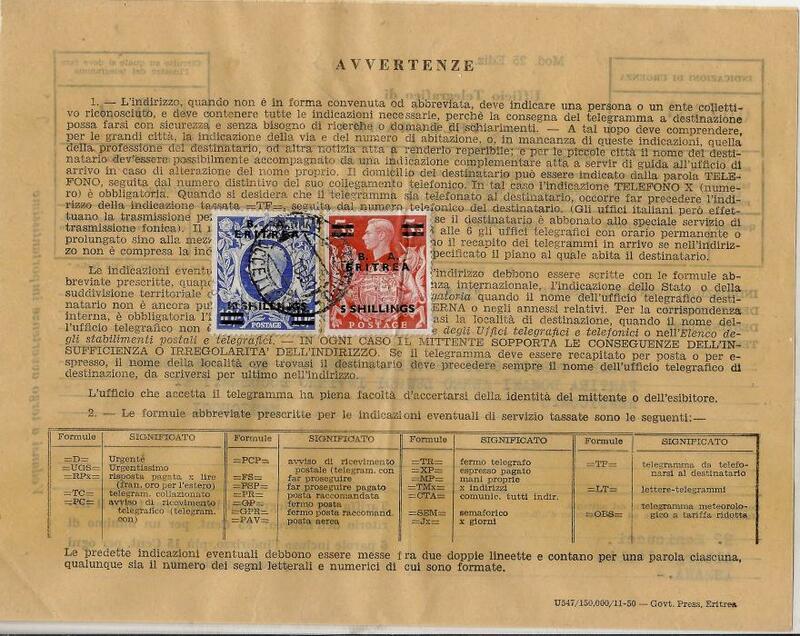 overprinted values including 9d. 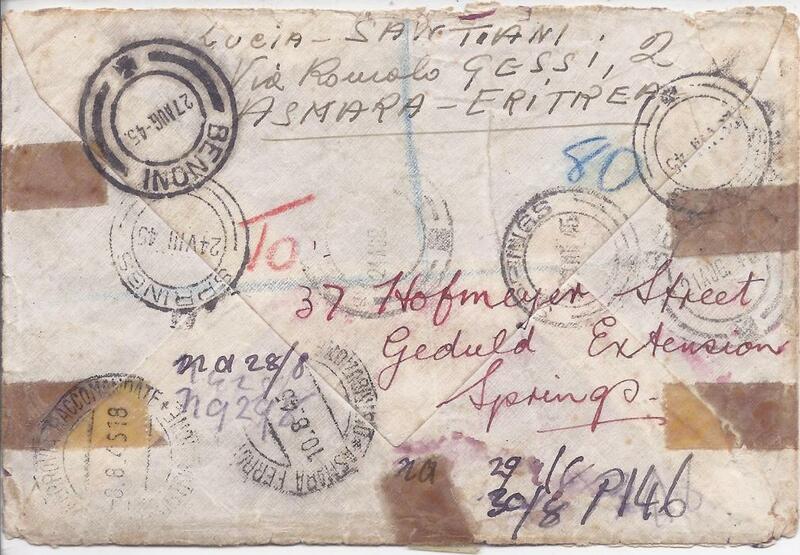 tied Cheren (Eritrea)cds, Aden Camp arrival backstamp. 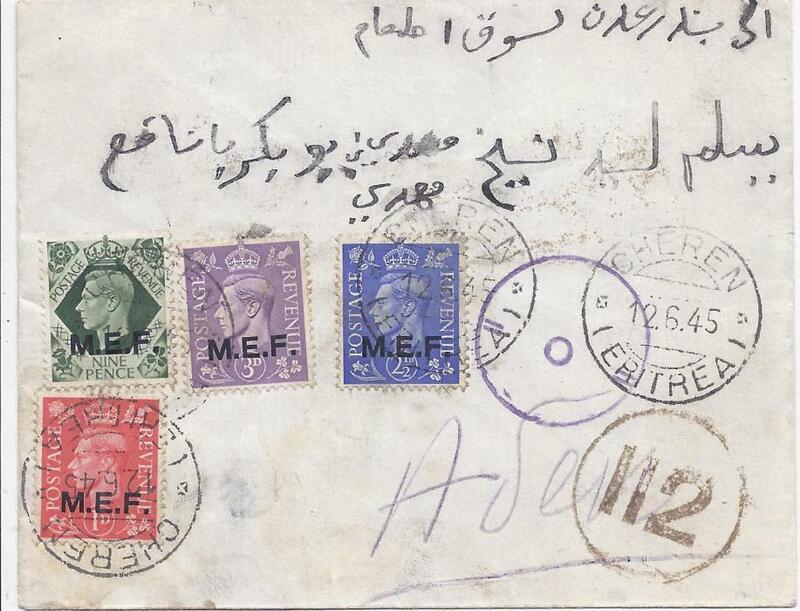 Eritrea: 1949 registered cover to London franked 20c. on 2d. and 2s50c. on 2/6d. 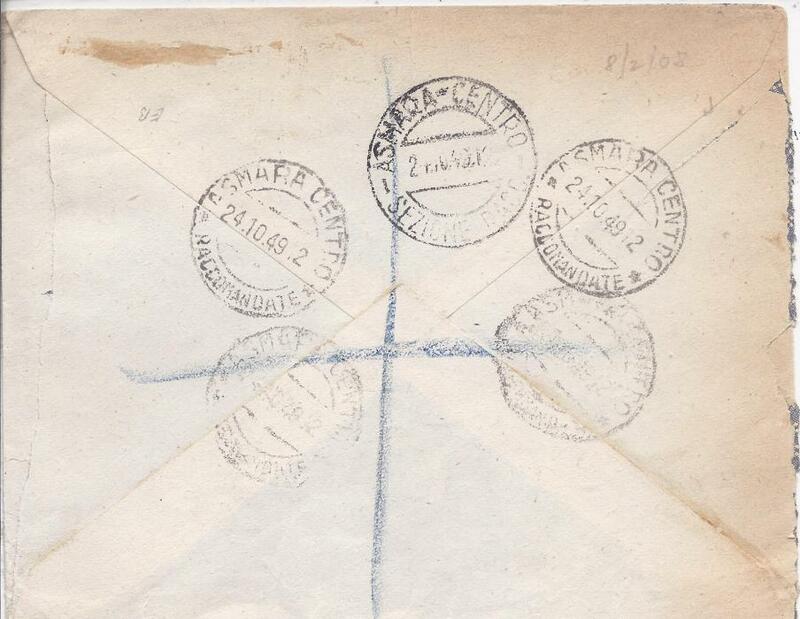 tied Asmara cds, further group of Asmara cancels on reverse; envelope roughly opened out for display.